Mamiya has announced the price and availability of its new DM40 medium format camera and a digital back of the same name. Priced at $21,990 for the camera and 80mm f/2.8 lens D series lens, and $19,990 for the digital back, they will start shipping from this month onwards. Both incorporate 40MP, 44 x 33 mm sensors and feature true 16 bit/channel RAW capture, ISO range of 80-800 and capture images at 0.8 seconds per frame. The DM40 digital back can be used with compatible medium or large format cameras via an adapter. Elmsford, NY - March , 2010 - Mamiya today announced the addition of the new Mamiya DM40 to its lineup of professional large-sensor DSLRs. Featuring a resolution of 40 megapixels with a peak capture rate of .8 seconds per frame and a sustained capture rate of 60 frames per minute, the Mamiya DM40 is the industry’s fastest large-sensor DSLR. The heart of the DM40 system is the new "DF" camera-core technology, developed by Mamiya, featuring two user-selectable shutter systems: leaf or focal plane. In demanding daylight situations, photographers can use predictable high speed flash synchronization to fill-in or overpower even the brightest ambient light on one of three new leaf-shuttered lenses designed by Schneider-Kreuznach and manufactured by Mamiya. The lenses - available in focal lengths of 55mm, 80mm, and 110mm - deliver an effective maximum flash sync speed of up to 1/1600th of a second. 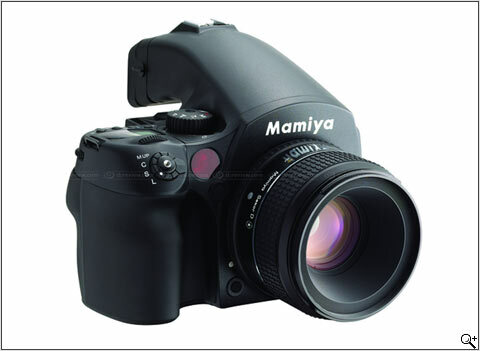 For more conventional situations, photographers can choose any one of 15 other world-class Mamiya optics, from 28mm to 300mm APO, designed for use with the cameras’ focal plane shutter system. Also newly announced, the Mamiya DM40 Digital Back will be available for those customers who wish to obtain the latest in high-speed and resolution digital capture for their existing Mamiya or large format camera. Supported cameras include: Mamiya 645AFD series, 645DF, Mamiya RZ series (via optional adapter), Mamiya RB series (via optional adapter), and 4x5 view cameras (via optional adapter). The Mamiya DM40 DSLR kit will be available in the U.S. at $21,990, including Mamiya 80mm f.2.8 D lens. The Mamiya DM40 Digital Back, also available in the U.S. at $19,990. Both are expected to be shipping in March, and include Capture One and Leaf Capture software.